A recently described species from the interior of Minas Gerais. Plants are fairly large and with tall inflorescences bearing showy orange-red flowers. Very rare and localized distribution in nature, and for the first time being propagated. What time of year does it bloom? Likely early Spring, I have a couple in spike right now. 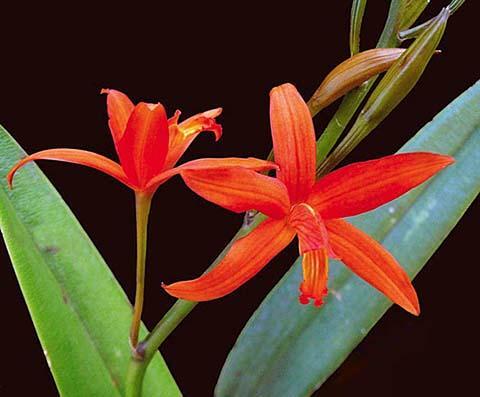 Essentially, we grow it like any other rupicolous Laelia. Temperatures down to the low 30s are ok if plants are kept dry, maximuns can go over 90 (for us, it has been 96 every day for a few days now and plants are doing well) but they have to be kept dry during the day, so water later on the day. We grow all our plants in regular Cattleya light, which mean about 50% shade. During Spring and Summer, plants like frequent waterings - every day or every other day depending on type of medium. ; but they like small pots, like any rupicolous. Hope that helps.